Good news North Coast! The much-anticipated sport Dungeness crab season will open on time this year, and the season’s first crustaceans can be legally hauled from the salty waters of oceans and bays beginning Saturday morning. After last year’s domoic acid debacle, which delayed both sport and commercial openers, this is welcome news. Here on the North Coast, winter crabbing is a tradition that dates back generations. Boats will be working the near shore waters, bays and river mouths baiting, setting and pulling pots and rings — all in the hopes of a big payout of rich, delicious crab. In Del Norte, Humboldt and Mendocino counties, the season runs from Saturday, Nov. 5 through July 30, 2017. The minimum size is five and three-quarter inches measured by the shortest distance through the body from edge of shell to edge of shell directly in front of and excluding the points (lateral spines) and the limit is 10. A valid California sport fishing license is required. For more information regarding recreational Dungeness crab fishing regulations and other crab species, visit Conservation/Marine/Invertebrates/Crabs. New state regulations went into effect on Aug. 1 regarding the crab fisheries and crab trap requirements. Dungeness crab size and bag limits are now uniform statewide. All crab traps will be required to have a destruct device, must be marked with the GO ID number of the operator of the trap, and may not be deployed during the seven days prior to the opening of the Dungeness crab season. For more info on the new regulations, visit https://nrm.dfg.ca.gov/FileHandler.ashx?DocumentID=132266&inline. In a press release issued on Nov. 2, the California Department of Public Health (CDPH) is warning recreational anglers not to consume the viscera (internal organs) of Dungeness crab caught in coastal waters north of Point Reyes (Latitude 38° 00′ N). This warning is due to the sporadic detection of elevated levels of domoic acid in the viscera of Dungeness crabs caught off the Northern California coast. CDPH believes that Dungeness crab meat is safe to consume, however, as a precaution, consumers are advised not to eat the viscera (internal organs, also known as “butter” or “guts”) of crabs. The best ways to reduce risk are: Remove the crab viscera and rinse out the body cavity prior to cooking, or boil or steam whole crabs, instead of frying or broiling, and discard cooking liquids. A small craft advisory will be in effect from 3 a.m. on Thursday to 4 a.m. on Monday, which will likely delay the sport boats from crabbing offshore this weekend. As of Wednesday, Saturday’s forecast is calling for south winds 5 to 10 knots with 15-foot waves at 16 seconds coming out of the west. Sunday is looking equally as bad, with winds out of the east up to 5 knots with west waves 14-feet at 16 seconds. The forecast will likely change, so before you head out, check the marine forecast at wrh.noaa.gov/eka and click on the marine tab. You can also call the National Weather Service at (707) 443-7062 or the office on Woodley Island at (707) 443-6484. To monitor the latest Humboldt bar conditions, visit: www.wrh.noaa.gov/eka/swan. Not quite as much rain in the forecast this week as in the past few, but a couple of smaller systems could drop another inch or two to the region. According to Reginald Kennedy of Eureka’s National Weather Service, Thursday and Friday will be on the dry side, but rain is back in the forecast for Saturday. “The next system will roll through on Saturday afternoon and stick around overnight. The Smith basin could see up to two inches and the Eel/Mad basins may see an inch. Sunday and Monday are looking dry, with the next chance of rain forecasted for Tuesday. It will be a weaker system, with the Smith basin seeing up to an inch and the Eel/Mad area receiving anywhere from a quarter to three-quarters of an inch. Next Wednesday and Thursday are both looking dry,” Kennedy added. 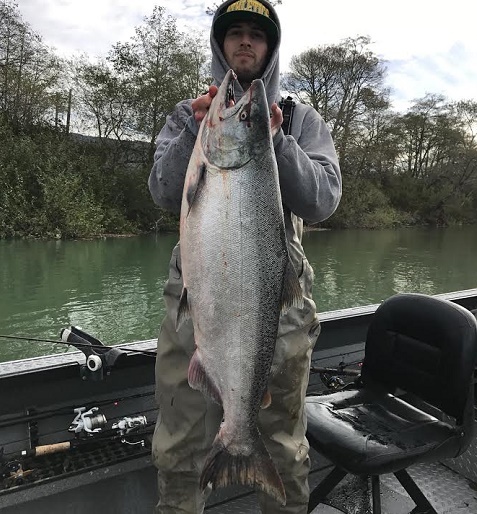 All North Coast rivers subjected to low flow fishing closures, including the Smith, Eel, Mad, Redwood Creek, and Van Duzen are currently open to fishing. The low flow closure hotline for North Coast rivers is (707) 822-3164. According to Mike Coopman of Mike Coopman’s Guide Service, the Smith is in great shape, and dropping slowly. He said, the river hasn’t dropped as quickly as predicted, and should continue to fish really well until we get the next round of storms. There continues to be lots of fish in the river, and both plugs and backbouncing roe are catching fish.”. As of Wednesday afternoon, the Smith was right around 10.5 feet on the Jed Smith gauge. 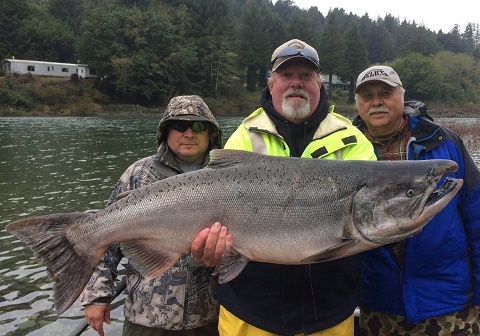 The Chetco dropped to 4,820 cfs Tuesday evening and should fish well Wednesday afternoon through Saturday reports Andy Martin of Wild Rivers Fishing. He said, “There is rain coming Saturday, which could increase flows again, although the gauge projection isn't showing that as of Wednesday. 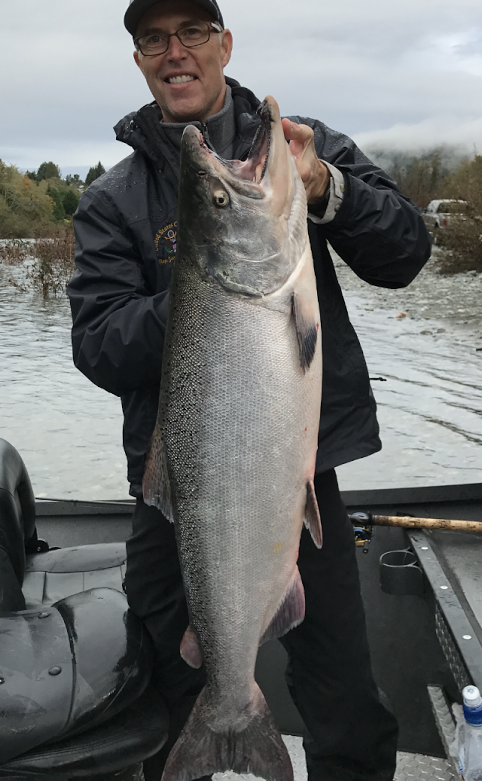 The Chetco has been blown out for the past week, although one boat went down last Saturday and got three nice kings in the high water, over 5,000 cfs. The gear restrictions end Nov 4, which means we will be able to back-bounce, and run plugs without a bobber, or a single-point hook. There should be some hatchery fish from Loeb park down.